GALLERY: City of Plymouth’s Sotheran claims victory at Westward Ho! CITY of Plymouth’s Kate Sotheran claimed victory in the under-11 girls’ race at January’s Westward League Cross Country meeting at a windy Westward Ho! on Sunday. Sotheran clocked 11.06 minutes for the run that included having to cross a number of ditches to finish six seconds in front of North Devon’s Lilan Clopet. Her club colleague Hannah Blair took second in the senior women’s race behind Cornwall’s Heidi Tregenza, while fellow City of Plymouth athlete Jamie Williams was fourth in the under-17 men’s race, which was won by North Devon’s Euan Kernahan. Tavistock’s Edward Smart and Michael Barton finished seventh and eighth in the men’s under-17 event. Tavistock enjoyed a good day at Westward Ho!, where conditions were much better than they were last year. The west Devon club had 10 athletes finishing in the top 10 of various races. They particularly impressed in the under-15 boys where Tavistock had three runners in the top six. Oliver Smart came third in a race won by North Devon’s James Hamish, with Bradley Stevens fourth and Jacob Heyarty sixth. Club colleague Jim Cole took fourth in the senior men’s race, which was won by Bideford’s Shaun Antell, who edged out his team-mate Ronnie Richmond after he lost a shoe early in the race. Plymouth Harriers’ Jordan Andrews was ninth. Cole is ranked third overall in the series after four of the six races. Tavistock’s Tilly McDowell was sixth in the under-15 girls’ race, which saw Newquay’s Tia Brown cross the line first. Joe Dix was eighth and Dan Luckham 10th in the under-13 boys’ competition, while Krystine Cade took seventh and Izzy Page eighth in the under-13 girls’ race. Taunton’s Joe Ponter and Exeter’s Jasmine Stone took victories in those races. 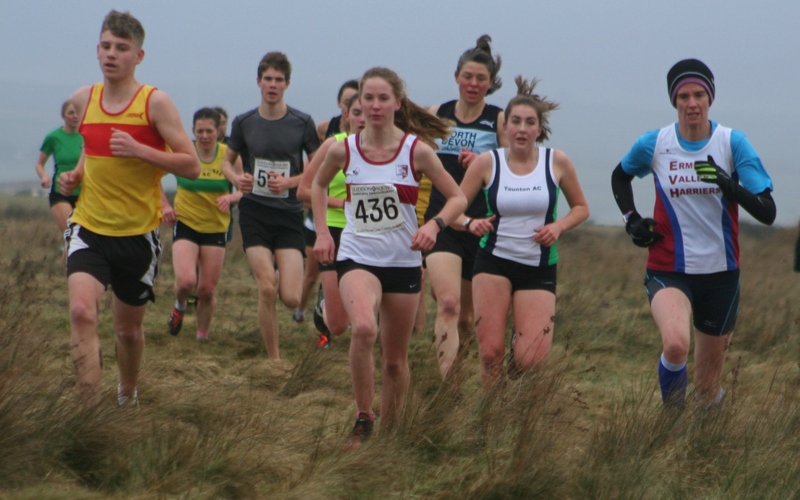 Tavistock’s Sam Lake was 10th senior women, one place behind Erme Valley’s Emma Lake, while Tamar Trotters’ Evan Barnes was 10th in the under-11 boys’ race, which was won by Exeter’s Charlie Hague. North Devon’s Eevee-May Banbury took victory in the under-17 girls’ race. As well as Tavistock, there was also a good turnout from Plymouth Harriers, who currently sit fourth in the men’s team event. Plymouth Harriers’ David Beckenkranger leads the male over-45 category after four races ahead of Tavistock’s Paul Hegarty, while Harriers’ team-mate John Porter is third in the men’s over-40 section. Tavistock’s Martin Exley-Deane tops the under-55 category ahead of Plymouth Musketeers Bryan King. Fellow Tavvy athlete Bob Chapman is second in the over-65 standings, while City of Plymouth’s Stephen Burns in second in the over-50 section. Tavistock’s Sam Lake leads the women’s over-35 category with two races to go, with club colleague Cathy Dunlop third in the over-45 section. City of Plymouth’s Paula Simson is currently second in the over-40 women’s standings, Erme Valley Harriers’ Katy Mogridge second in the over-50s and Plymouth Harriers’ Karen Eccles third in the over-55 standings.